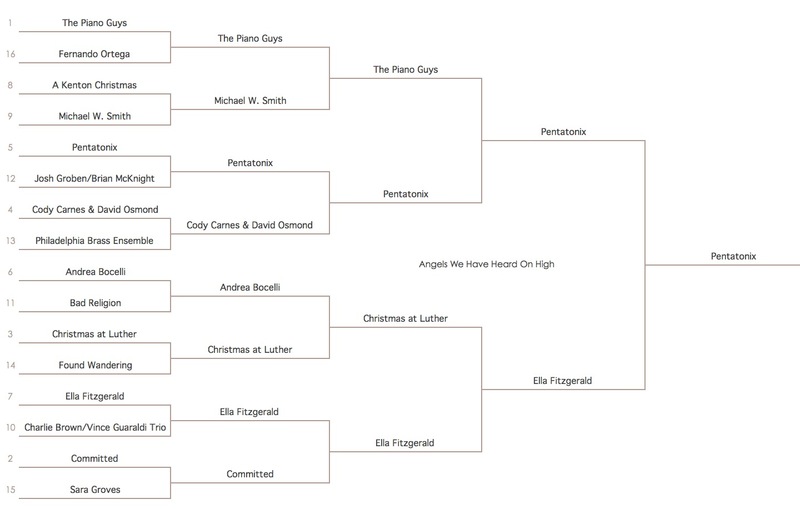 By one vote…Pentatonix emerges victorious! So I am now opening submissions for Week 3 and 4 of Advent Caroling Madness. Since Christmas is on Wednesday, I need to have week 4 up and running next Sunday, so we have time to do the voting. First, week 3: I invite your submissions of the best version of “Joy to the World”. You can put them here as comments, or on Facebook, or send me an email, or gift me iTunes cards to buy them, whatever floats your boat. 🙂 I will consider submissions that I receive before Tuesday at 5 pm PST, and release the bracket sometime that night. For week 4, I have sort of a weird idea. I’d like to have a bracket of some of the non-classics. For example, Amy Grant’s “Tennessee Christmas” might go up against Mariah Carey’s “All I want for Christmas is You”, or Band Aid’s “Do They Know it’s Christmas Time at All”. Give me your nominations for the Christmas songs that haven’t been covered by everyone; sort of the newish contemporary Christmas songs. Find the original recorder of the song (ie., the group Alabama has covered “Tennessee Christmas” but it’s clearly Amy’s song), and submit. I’ll have to use a sort of fuzzy logic about what hasn’t already become “classic”. “Jingle Bell Rock” has clearly moved into the common lectionary where lots of people put it on their Christmas recording, as well as “The Christmas Song (Chestnuts)”. So those kinds of songs don’t count. Make sense? I’ll need week 4 submissions by Saturday the 21st at noon PST. Thanks for joining Advent Caroling Madness! So, in voting for the finals in “Angels” week I read an email or post ‘somewhere’ in regard to some marital stress (tongue-in-cheek), I think the comments were made by Ms. Perez, who I do not know, and the comment had something to do with her husband throwing a vote against PTX in order to make the playing field level for Ella. Being of Quaker conscience I had to act. I could not let their marriage go on the rocks because of unmanipulation. So I listened to BOTH PTX & Ella, and cast the ‘deciding’ vote in favor of PTX. I hope that my sacrifice will go unrewarded. Let the Games continue! So how Christmasy do they have to be? On a Christmas CD we have, there’s a recording of I’ve Got My Love to Keep Me Warm, by The Mills Brothers. It never actually mentions Christmas or Jesus. Can I submit the earlier Billie Holliday version? Submit away! I’ll consider anything, but no promises what will make it in the bracket.